The G-Series’ vertical-lift design provides operators with ample lift heights and improved visibility. John Deere revealed four new Final Tier 4 G-Series skid steers and one compact track loader on Feb. 12. with customer feedback in mind. The new machines (312GR, 314G, 316GR, 318G, 317G) are designed to provide more agricultural material handling, construction and landscape solutions to customers. "With the addition of these new G-Series models, John Deere now offers a full line of skid steers and compact track loaders to meet the quality, performance and price point needs of today's customer," said Gregg Zupancic, product marketing manager of John Deere Construction & Forestry. "Customer input led to increased durability, higher engine power, improved fuel capacity and updated cab and productivity features, so when customers buy or rent a John Deere G-Series machine, it isn't just an easy decision, it's one they can make with total confidence." The five machines include three vertical and two radial-lift options. They were also created to improve operator and machine productivity while reducing daily operating costs. The G-Series machines have improved horsepower-to-weight ratios and optimized boom designs to provide lift heights in excess of 10 feet. The vertical-lift design on the 314G, 318G and 317G provide all-around visibility. With the radial-lift option on the 312GR and 316GR, operators have a one-person boom lockout system for safety that can be operated within the cab. 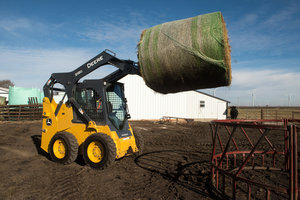 To learn more about all of the features that the new G-Series machines have to offer, visit www.JohnDeere.com or speak to your local John Deere dealer.